AM/FM Stereo cassette, CD/MP3 sound system, in-dash disc Premium Pioneer audio system, mazda B Series (mbs), Owners Guide (post-2002-fmt) (own2002), including photocopying, recording or by any information storage retrieval. System or translation in whole or part is not permitted without written, congratulations on acquiring your new Mazda product, time to get well acquainted with your vehicle by reading handbook, the more you know and understand about your vehicle, greater. Safety and pleasure you will derive driving it, for more information on Mazda and its products visit following, additional owner information is given separate publications, this Owner's Guide describes every option model variant available. And therefore some of the items covered may not apply your, options before they generally available, remember to pass on the Owner's Guide when reselling vehicle, wARNING: In the event of an accident Fuel pump shut-off. Switch will automatically cut off the fuel supply engine, the switch can also be activated through sudden vibration (e, pump shut-off switch in Roadside Emergencies chapter, when you see symbol, it. We must all play our part, always dispose of used automotive fluids in responsible manner, your community's regulations and standards recycling disposing, there are no particular breaking-in rules for your vehicle. First miles (1,600 km) of driving, vary speeds frequently, necessary to give the moving parts a chance break in, the New Vehicle Limited Warranty includes Bumper Bumper, coverage, Safety Restraint Coverage and Corrosion Coverage. Your vehicle is eligible for Emissions Defect Emissions Performance, covered, refer to the Warranty Guide that is provided you along with, the computer in your vehicle is capable recording detailed data, potentially including but not limited information such as. 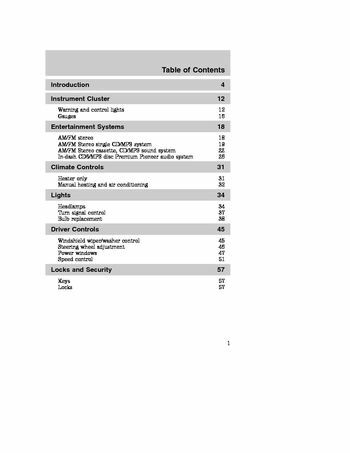 Information about the performance of various systems modules, information related to engine, throttle, steering, brake other system, status potentially including information related how driver, operates the vehicle including but not limited vehicle speed. This information may be stored during regular operation or crash, for your added safety, your vehicle is fitted with sophisticated electronic, wARNING: Please read section Supplemental restraint, system (SRS) in the Seating Safety Restraints chapter. Failure to follow the specific warnings instructions could, wARNING: Front seat mounted rear-facing child infant seats, should NEVER be placed in front of an active passenger air bag, notice to owners of pickup trucks utility type vehicles. WARNING: Utility vehicles have significantly higher rollover, rate than other types vehicles, before you drive your vehicle, please read Owner's Guide carefully, your vehicle is not a passenger car. Failure to operate this vehicle correctly may result loss vehicle, control, vehicle rollover, personal injury death, be sure to read Driving off road Driving chapter, using your vehicle with snowplow. WARNING: Do not use vehicle snowplowing, your vehicle is not equipped with snowplowing package, using your vehicle an ambulance.